TakBook – One Million and Counting…: Book Drive for Victims of Calamities, a 3K charity­ run was hosted by DLSU Science and Technology Complex (DLSU­-STC) Libraries in partnership with the Philippine Librarians Association, Inc. – Southern Tagalog Regional Council (PLAI­-STRLC) and Association of Librarians in Laguna Province, Inc. (ALLPI). This activity was held at DLSU-­STC in line with the celebration of the National Book Month and the Library and Information Science Month on November. The activity was held simultaneously in the provinces of Cavite, Laguna, Batangas, Rizal, and Quezon on 17 November 2013. For the province of Laguna, the assembly point and book drop registration was done at East Canopy Lobby, Milagros Del Rosario Bldg., DLSU­-STC Leandro V. Locsin Campus, Biñan City. This project aims to raise one million books to help those libraries damaged by calamities in the Southern Tagalog Region, Zamboanga, Cebu, Bohol, Leyte and other regions. The project was coordinated to DLSU-­STC through its Librarians headed by Justina P. Garcia, also officer of PLAI-­STRLC and the current president of ALLPI, Yugosto A. Balbas, College Librarian and Candy May N. Schijf, Pre-­School Librarian. 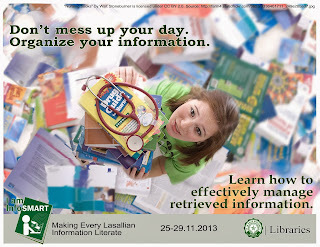 As part of the IamInfoSMART campaign of “making every Lasallian information literate”, The Libraries invites faculty and students to one-on-one Turnitin tutorials anytime between 8:00am to 5:00pm from 25 November (Monday) to 28 November (Thursday) 2013 in the IamInfoSMART Exhibit Fair at the 6th floor lobby, The Learning Commons, Henry Sy Sr. Hall. Students who wish to join should have an existing Turnitin account and a ready-made paper for submission. Uploaded paper will be electronically checked based on originality. Students must view the originality report to check whether they got a “Green”, “Blue”, or “Red” square. Students who got “Green” or “Blue” originality report will get a prize. Winners will be announced on 29 November 2013. All prizes must be claimed until 15 December 2013 only. Turnitin is a cloud-based service for originality checking, online grading and peer review and is one of the most widely distributed educational applications in the world. Turnitin is used by more than 10,000 institutions in 126 countries to manage the submission, tracking and evaluation of student papers online. Training Guides for Instructors and a Quickstart Guide for Students are available in their website for those who want to learn more about using the service. The DLSU Libraries will be offering a Book Amnesty Program dubbed as Fines No More: Zero Payment for Overdue Books. The program covers library patrons who still have with them unreturned books borrowed or loaned in or prior to AY2010-2011 and will run from November 25 to December 31, 2013. During this period, fines will be waived for all unreturned books thus clearing the patron of his/her library accountability. Faculty, staff, students and alumni with unreturned books borrowed in or prior to AY 2010-2011 are advised to take advantage of this opportunity to avail of the waived overdue fines. For inquiries please contact The Libraries at loc. 620 or send an email to library@dlsu.edu.ph. You may also send us your queries through the Libraries' Facebook and Twitter pages. Thank you. 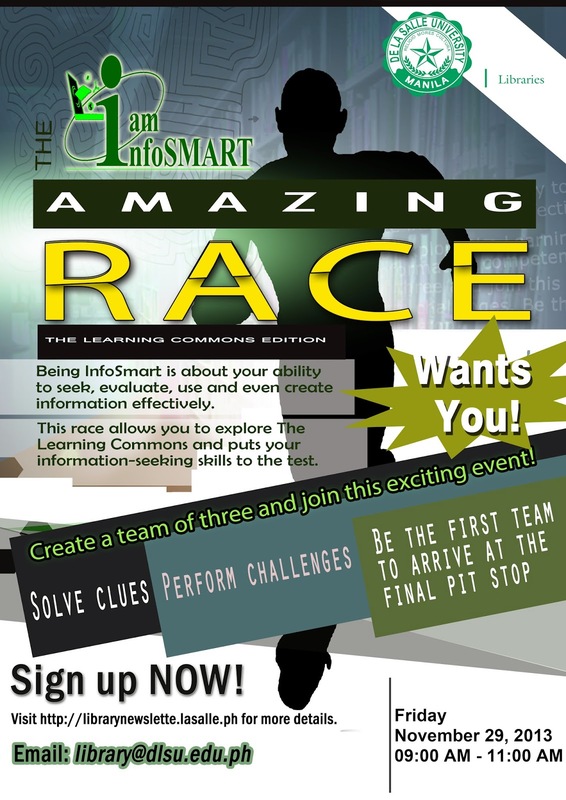 As part of the IamInfoSMART campaign of “Making Every Lasallian Information Literate”, the Libraries will hold the IamInfoSMART Amazing Race on 29 November 2013 (Friday), 9:00am with the start line at the 6th floor lobby of The Learning Commons, Henry Sy, Sr. Hall. Based on the reality TV series, the contest will lead contestants to different sections of The Learning Commons, where they must perform various tasks in a race against other teams. This activity aims to teach students how to (1) determine the nature and extent of information needed; (2) find and locate the needed information effectively and efficiently; (3) evaluate information sources; and (4) use information ethically and legally. This contest has limited slots only. REGISTER NOW! For inquiries please contact The Libraries at loc. 620 or send an email to library@dlsu.edu.ph . 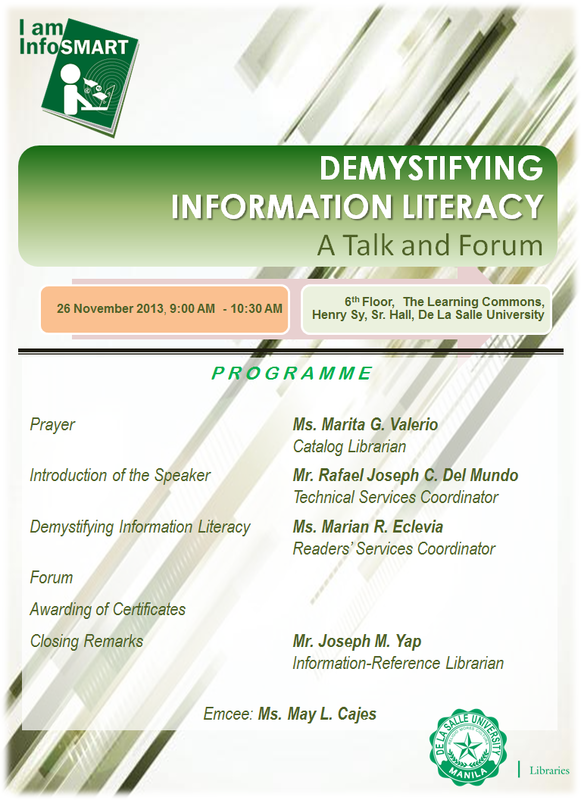 As part of the IamInfoSMART campaign of “Making Every Lasallian Information Literate”, The Libraries will conduct a talk and forum entitled “Demystifying Information Literacy” on 26 November 2013 (Tuesday), 9:00am to 10:30am at the 6th floor lobby of The Learning Commons, Henry Sy Sr. Hall. The resource speaker is Ms. Marian R. Eclevia, Coordinator for Readers’ Services of the DLSU Libraries, who has more than a decade of experience in the field of reference and information service. She has earned her Bachelor and Master’s degrees in Library and Information Science from the University of the Philippines. This activity aims to increase participants’ understanding to information literacy as a vital component of lifelong learning, to measure their information literacy skills, and to promote library services and programs. Interested participants are requested to pre-register online not later than 22 November 2013 (Friday) using this Electronic Form. For inquiries, please contact The Libraries at loc. 620 or send an email to library@dlsu.edu.ph. 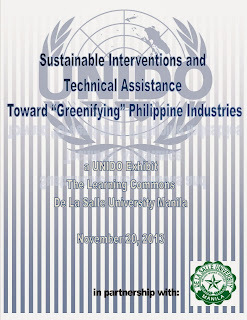 Various project initiatives of the UNIDO will also be presented at the 12F of The Learning Commons after the opening ceremony. 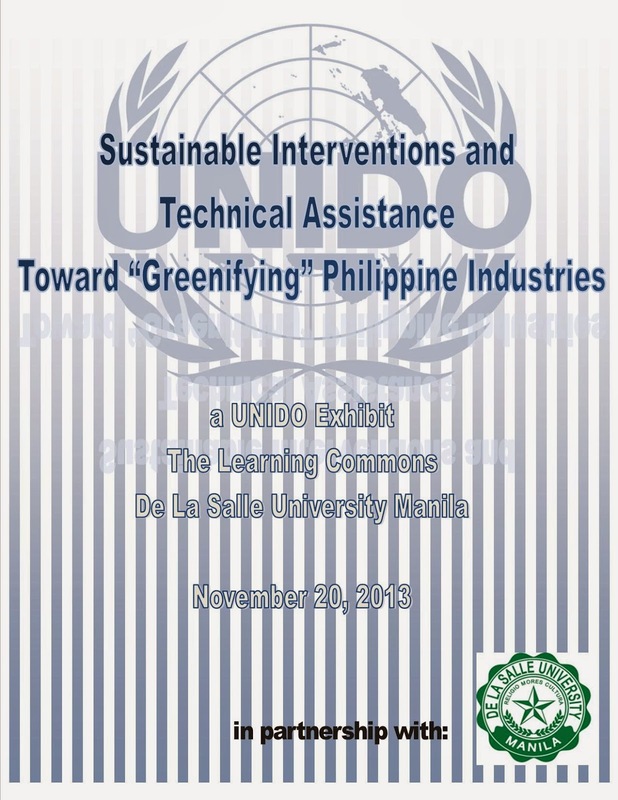 The UNIDO Exhibit will run from 20-21 November 2013 (Wednesday-Thursday). For inquiries, please contact The Libraries at local 620 or send an email to library@dlsu.edu.ph. 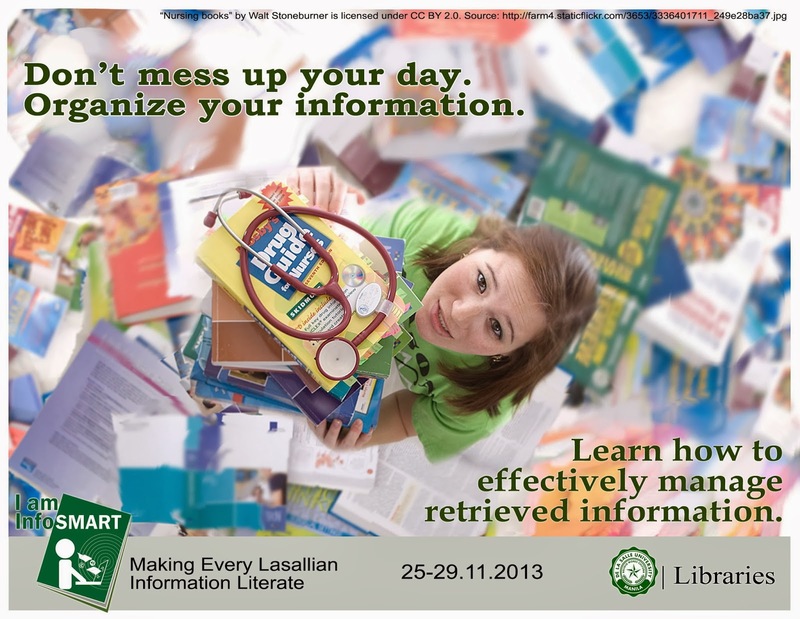 As part of the IamInfoSMART campaign of “making every Lasallian information literate”, the Libraries will conduct an on-the-spot poster-making contest on 28 November 2013, 9:00 am at the 6th floor lobby of The Learning Commons, Henry Sy, Sr. Hall. This activity aims to increase students’ awareness on the importance of information literacy as a vital component of lifelong learning, and at the same time it seeks to consolidate and showcase students’ understanding of information literacy through the creative arts. This contest is open to all members of the academic community, including faculty, staff and students (both undergraduate and graduate) of De La Salle University. All interested applicants must pre-register on or before 27 November through this online form. Contestants are requested to be at the 6th Floor of The Learning Commons before 9:00 AM of 28 November. 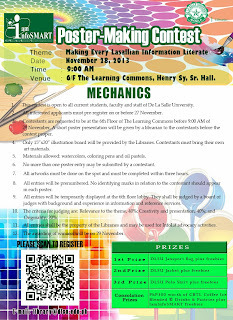 A short poster presentation will be given by a librarian to the contestants before the contest proper. 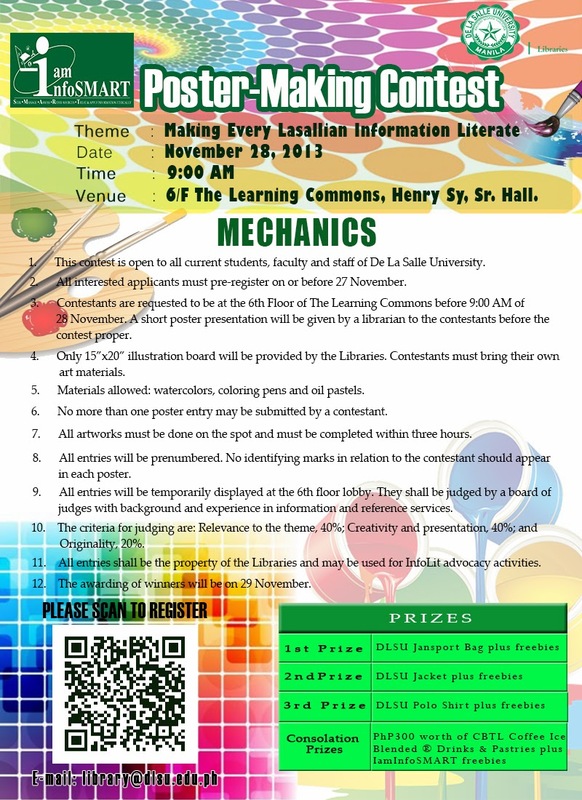 The theme of the contest is “Making every Lasallian information literate”. Only 15”x20” illustration boards will be provided by the Libraries. Contestants must bring their own art materials. Materials allowed: watercolors, coloring pens and oil pastels. Bringing of flammable art materials is prohibited. No more than one poster entry may be submitted by a contestant. All artworks must be done on the spot and must be completed within three hours. All entries will be prenumbered. No identifying marks in relation to the contestant should appear in each poster. All entries will be temporarily displayed at the 6th floor lobby. They shall be judged by a board of judges with background and experience in information and reference services. The criteria for judging are: Relevance to the theme, 40%; Creativity and presentation, 40%; and Originality, 20%. All entries shall be the property of the Libraries and may be used for InfoLit advocacy activities. The awarding of winners will be on 29 November. 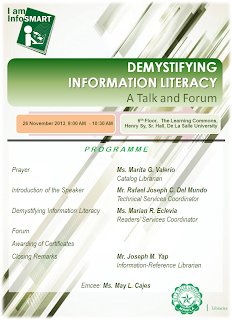 In celebration of the Library and Information Services (LIS) month this November, the Libraries will be running an information literacy (IL) campaign entitled IamInfoSMART with the theme, “Making every Lasallian information literate”, on 25-29 November 2013. 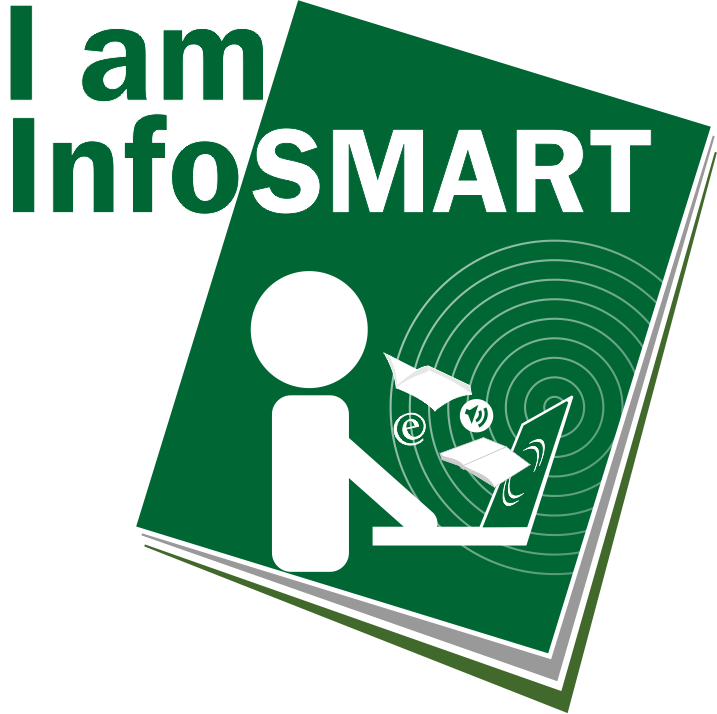 SMART refers to the ability to: Seek for the right information; Manage retrieved information effectively; Assess information critically; Refer information sources correctly; and Treat and apply information ethically. IamInfoSMART is a week-long fair of exhibitions, learning sessions and interactive games, which aims at honing students to become information literate by equipping them with the necessary IL skills and raising their awareness on the importance of IL in their pursuit for academic and research excellence. 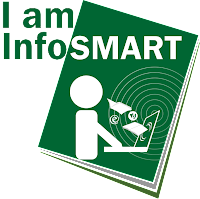 More information about IamInfoSMART and other upcoming events will be posted here and at the Libraries' Facebook account. For questions and inquiries please contact The Libraries at loc. 620 or send an email to library@dlsu.edu.ph . UPDATE: Because of projected inclement weather, the Takbook fun run is rescheduled to 17 November 2013 (originally 10 November). 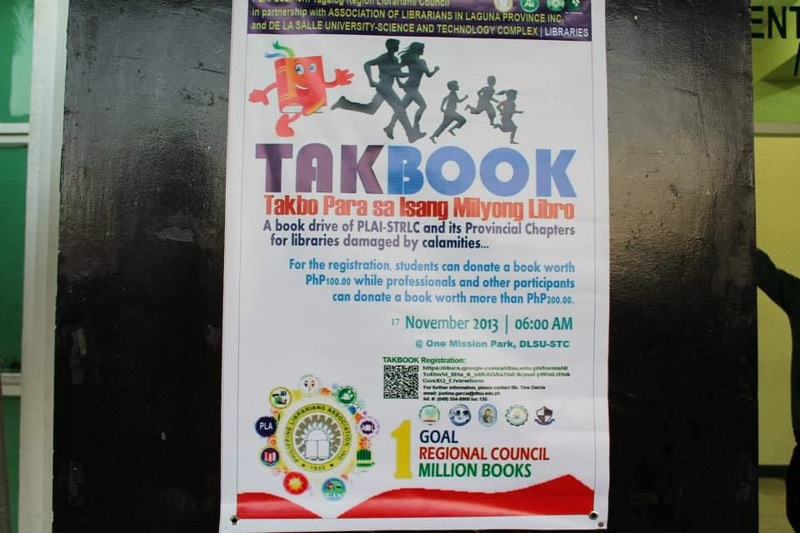 The DLSU Science and Technology Complex (DLSU-STC) Libraries, in partnership with the Philippine Librarians Association, Inc. – Southern Tagalog Regional Council (PLAI-STRLC), would like to invite the community to take part in “TakBook – One Million and Counting…: Book Drive for Victims of Calamities”, a fun-run with a cause in line with the celebration of the National Book Month and the Library and Information Science Month this November 2013. TakBook aims to donate books and other instructional materials to libraries badly affected by calamities in the Southern Tagalog Region, Zamboanga, Cebu, and Bohol. It will be held simultaneously in the provinces of Cavite, Laguna, Batangas, Rizal, and Quezon on 17 November 2013, Sunday at 06:00am. The DLSU-STC Libraries is the host institution for the province of Laguna. Registration fee is in the form of book donations. Interested student participants may register with a book donation value of PhP100.00, while professionals and other participants may register with a minimum book donation value of PhP200.00. Pre-registration is also now open via this Online Form. 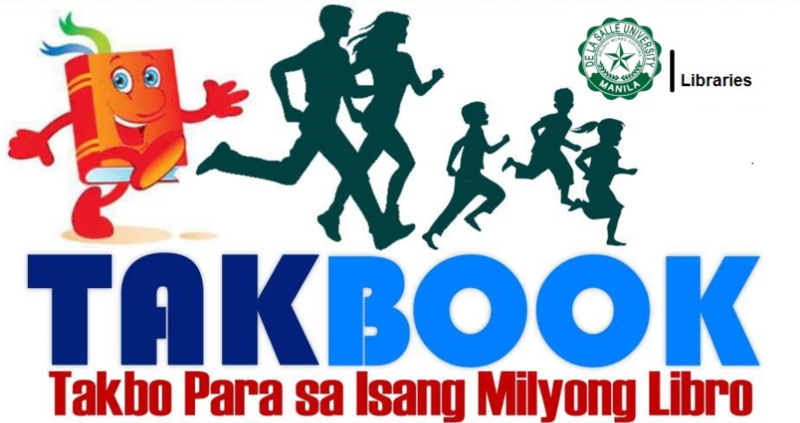 TakBook assembly and book drop registration on 17 November 2013 will be at the East Canopy Lobby, Milagros Del Rosario Bldg., DLSU-STC, Leandro V. Locsin Campus, Biñan, Laguna. Lasallian participants are advised to wear a DLSU shirt or any green/white-colored shirt for recognition. For more information, please contact Ms. Tina Garcia, Coordinator for DLSU-STC Libraries, via email at justina.garcia[at]dlsu.edu.ph, by phone at (049) 554-8900 local 135, or visit the STC Integrated School (STC-IS) Library at the Second Floor, Left Wing of the newly-built IS Complex Building.